Jordan is probably best known for the ancient city of Petra - now one of the New Seven Wonders of the World; and for the Dead Sea – the lowest point on earth at 402 metres below sea level. Our rides in Jordan are best suited to confident riders, as all of the horses are active and forward going Arabians and there will be lots of long trots and canters in wide open spaces. Arabian horses were developed in desert climates and are renowned for their stamina and speed. In Jordan we work with a Bedouin family based in the Wadi Rum. We use their horses and they guide the trip so this is a genuine local experience. 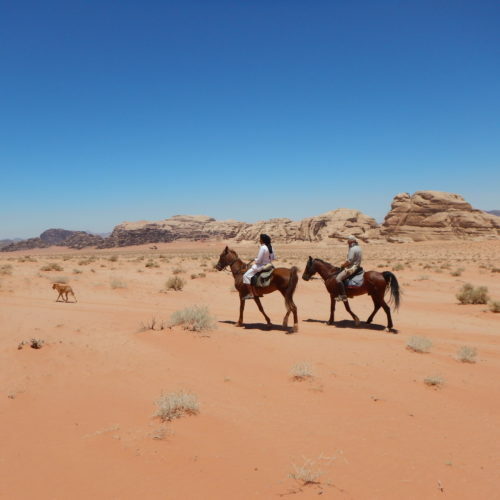 A trail ride through the Wadi Rum desert on Arabian horses with nights spent camping under a clear star-filled sky. On the first day you visit the ruins of Petra the ‘rose red city’ set deep inside a narrow gorge.